So here we are. Almost three years after Digimon: System Restore started breaking down the adventures Tai and company brought us at the turn of the century, we've reached the series currently airing on American television. Hopefully, it will continue airing on American television. There are a lot of kids out there who don't know what Digimon is and need a proper introduction. Some longtime fans might scoff at the idea that Digimon Fusion constitutes a proper introduction to the franchise. This stretches everything we've seen before and then some. It takes the DNA evolution that threw everybody for a loop in Zero Two and made it part of the core gaming system. It takes the digital plain concept Tamers used to add color to its world and breaks the Digital World into countless zones to fight over. Like Frontier, it abandons the traditional human-Digimon partnership in favor of a new wrinkle that leads to missteps such as favoring certain kids and making others next to worthless. Like Data Squad, it takes an aggressive, confident attitude that rivals Gurren Lagann. Hell, the guy who voices Kamina is both Ballistamon and Dorulumon. Who the hell does he think he is? It's still Digimon though, with both the good and the bad that comes with being Digimon. It's still kids and monsters teaming up to save the world, and Fusion does the best job creating the epic feel that should come with such a massive undertaking. By de-emphasizing the single-partner relationship, it creates massive armies siding with good, with evil, and with Nene. It's still evolution sequences, and while Fusion's are way too repetitive, the ability to mix and match at least adds some variety once in a while. It's still at the mercy of the network censors, and they're back with a vengeance. While no series totally escaped the knife, Fusion is downright regressive, editing out or covering up anything that's remotely risque. It doesn't help that Fusion is by far the most risque series when it comes to fanservice. Don't be surprised if Mervamon is entirely pixelated at all times. It still takes forever to get going, which is something that plagues every season. So much time is spent early on introducing the super-sized cast and the many new concepts that it's easy to get overwhelmed, especially with so much emphasis on Mikey and Shoutmon. It takes a while for them to be as interesting as characters like Dorulumon, Nene and Reapmon, and the show suffers when it keeps things simple. Once Mikey gets the hang of the world and is comfortable playing with the many new concepts the show affords him, the show improves. One place where Fusion is markedly different is its episode structure. It's either one, two or three seasons depending on how you count. The banner of Digimon Xros Wars includes three different flavors- vanilla, Generals, and Hunters. Each is its own story arc, its own opening theme, and probably should be judged independently. Generals ditches the well-meaning but mostly useless Angie and Jeremy and is tighter and more focused. Hunters is basically terrible. So while the episode count will treat them as one season, each of the three will get its own GPA when we mail report cards. Finally, after a tepid reception on Nickelodeon and later NickToons, the dub is starting from scratch starting next Saturday on the CW. Given the alternative of continuing the twice weekly routine for the first fifteen episodes and waiting for the dub to catch up, we're going to follow along with the new airtimes, with posts on the Monday after each episode airs. Yes, this means we're taking a week off. While it's safe to assume that all of the first arc will be aired somehow, somewhere, there's no such guarantee for Generals and Hunters. I'll keep my eye on any news (or just ask Kyle Hebert when I see him at Anime Milwauke next month) regarding a dub of Generals. I will switch to the Japanese version only when it becomes clear that there are no imminent plans to dub further episodes. Regardless of the actual time difference, going from the climax of Data Squad being all about human resilience to a song called Never Give Up is sweet. The animation leaves a lot to be desired, but the song holds up. We're not doing the Fusion opening on account of its autotune awfulness, but it must be pointed out that despite its autotune awfulness, it's still the second best English opening. 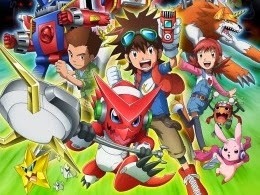 I was wondering once your Digimon reviews were done what would you move on to next? I'll probably be getting back to my original fiction, touching up my webnovel series or writing a new book. I'll still keep running my Digimon panels at conventions and probably keep the Tumblr page active. 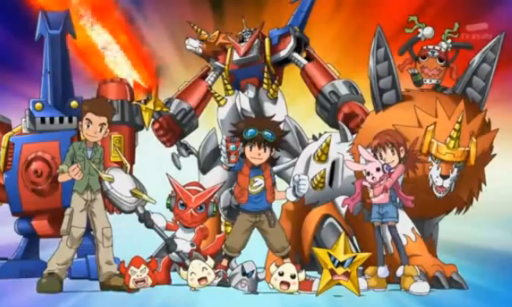 Once all this is over, I wonder if there'll be another Digimon series by then. It's a rather difficult thing to conceive of at this point...but I wonder. Saban dubbed the first 30 episodes.They're probably dub more because it does better then Megaforce. It didn't help that Nick did little to nothing to promote the series. I had to hear of Digimon Fusion's premiere on Nick from a forum. On the bright side, at the very least Digimon fusion won a on-line vote on the Nicktoons website. It doesn't mean much, but at least it has some fans. I tried to like the dub.I really did.It started out good,but it progressively started to get pretty bad.The dialogue was getting stupid and annoying.The edits were getting intolerable. Anyway,according to Bandai,there will be toys and stuff in North America.Including the Fusion Loader.